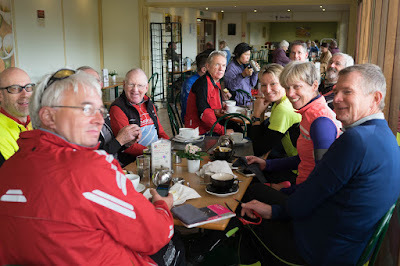 Alex writes: Nine of us gathered at Brookside for this morning's ride: me, Tom, Rupert, Peter, John S, Li, Paul, Ian and Seb. The forecast for today had been improving all week and we were promised sunshine and light winds for today's excursion north of Cambridge. 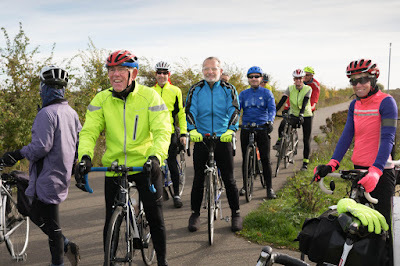 We cycled through town along Regent Street and then up Castle Hill, along the Huntingdon Road and through Girton to join the guided busway heading west. Knowing that some members wanted to “intercept” the ride on-the-fly I had circulated a GPX of the route beforehand and estimated we would arrive at the Longstanton bus stop at 10:10. We arrived exactly on time to find Andy and Sarah waiting to join us. 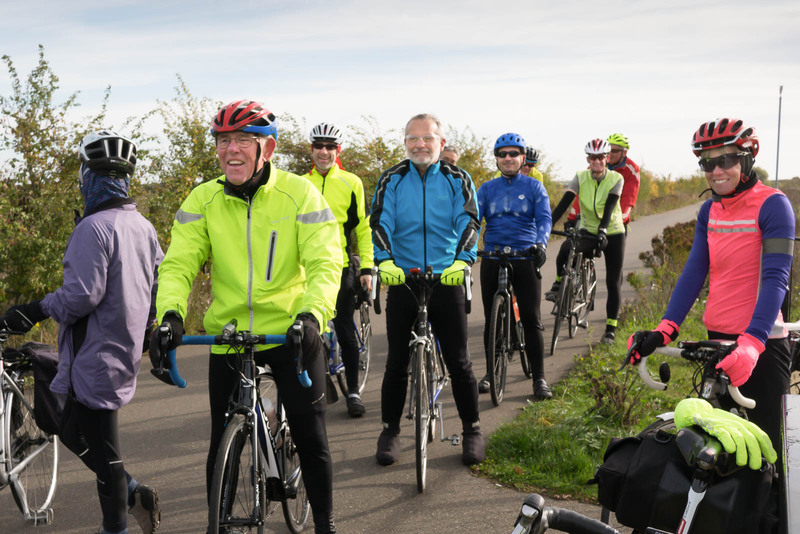 We then headed north to Willingham where Mike CC and Mike P joined too. There's not a lot of choice of roads in this part of the country, and today I had chosen to take a direct route to coffee along the B1049 from Cottenham. 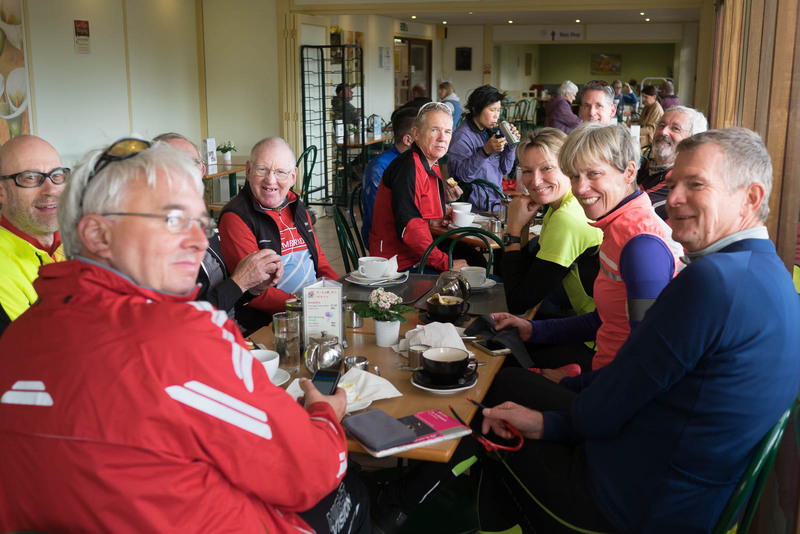 This is a well-surfaced road and with light traffic and a slight tail wind we made good progress arriving in Wilburton at around 11 o'clock where we found Eva and Adrian already installed in the café. The Twenty Pence Garden Centre had a large variety of different cakes, tarts and other temptations on offer. 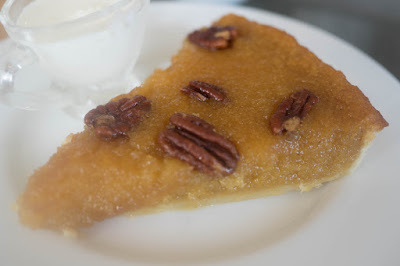 I chose to have a slice of treacle tart. After the usual comings and goings, eleven us were riding on to lunch. 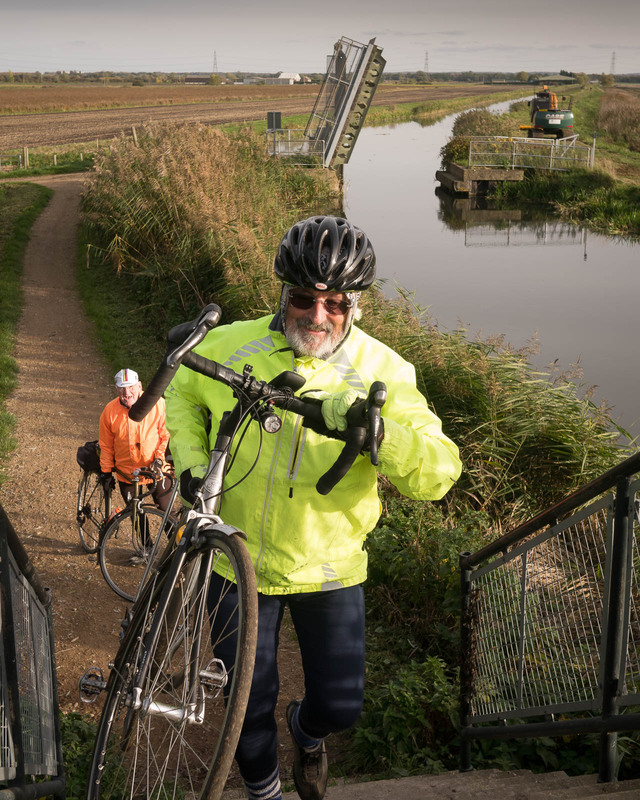 We rode north of Wilburton and entered Grunty Fen for our first taste of characteristic Fenland cycling with its long straights and ninety-degree bends. Fortunately today the wind was light and the sun was out, making it a pleasant experience. We continued north to Coveney where, looking south we could see Ely Cathedral clearly in the distance. Then looping east through Little Downham and then turning south we rode along the B1411, swept into Ely, rode past the cathedral, and zoomed down the slope to the River's edge and the Cutter Inn, our lunch destination. We had made good time and were placing our orders by 12:45. After lunch our return to Cambridge was to be mostly on National Cycle Route 11. We took the narrow path on the bank by the Great Ouse and then the succession of tracks and quiet roads that eventually took us to Lode. With he clocks just gone back the sun was already low in the sky and the quality of the light made for some attractive views on the way. The recent rains had made some of the going a bit squidgey, necessitating some pauses to de-clog mud-filled mudguards. Still we made good progress and were confident of getting back to Cambridge before dark. As usual various people peeled off to make their ways home as we progressed, and Seb and I were the only two riders left when we reached Brookside. 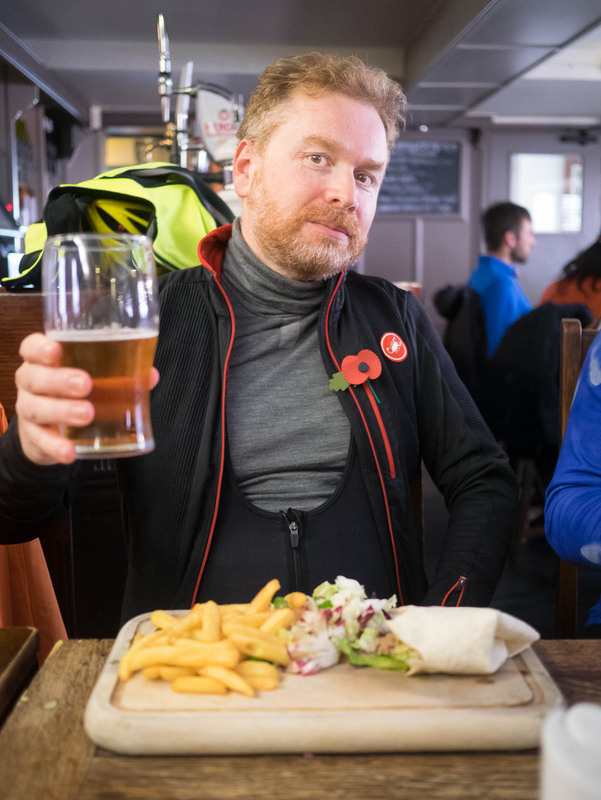 I had cycled 91½ km (57 miles). My metric Eddington number stands at 66.